I arrived on a period of R & R from my 4 month detachment in the gulf states. Organization had been a real pig from my end as I was only entitled to fly to the UK! "But you fly into Akrotiri anyway!" I said "Just let me off the plane! it won't cost any more!" "No! you need 1* approval to land in Cyprus!" I was told "You can't go there!" Depressed but determined I emailed a friend of mine, Dave, and told him the story. 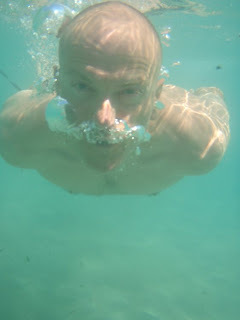 I asked if he could help as he was already in Cyprus at Episkopi. He said he would try but neither of us held out much hope. The next morning I got a phone call from Dave who told me to check my email and fill in the form he'd sent, get it signed by the boss and send it back! I did this and a day later I recieved my staff clearance number which I paraded in front of the Admin Staff! "Up yours to your 1* approval I'm going!" I landed the morning of 3rd of July 2008 and was met by Dave who had offered to house me for the week. 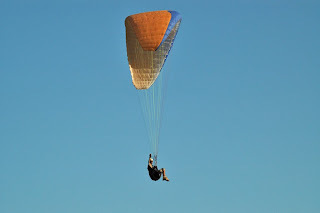 He had already been over to the Paragliding store and picked up a Nova Primax and a Fire Bird harness and helmet. What a star! we popped to see Steve Miller that morning and he was busy fixing up his new house. Nice! he told me that I had to join the Curiuim soaring club which was no problem and that I also have to return to the island again to help keep the club alive. Dave's house is nice with a patio and a 2 up 2 down arrangement. The garden (If that's what you call it) appears as though it has never even heard of water let alone grass! it's barren and wasted as Cyprus are in the middle of a 4 year drought. Even if it did rain I don't think much would grow as the ground is all pebbly and there are a couple of rocks in the middle the size of a mini. That afternoon we popped to Curium bay to do a spot of ground handling as it was quite strong on the top and was quite beyond my ability. We played around for about an hour, had a spot to drink and drove up the top to see what was happening. It was still strong so Dave attempted anyway and managed to wrap his wing around a post and tangle his lines in quite a nasty bush. Half an hour later we had removed the twigs from his lines and Dave sheepishly packed up and we went for a drink. On the 4th July the wind was such that I managed a couple of 20 minute soaring flights off Curium with a bottom landing followed by a sweet top landing, Dave was seriously impressed as he said most new comers to the site land in the sand pit near the beech or even on the beech. I had to give that a go as there is and ice-cream man who dips his Mr Whippy's in Chocolate mmMMMmmmm Chocolate! 5th July again was strong (18mph), I attempted a launch and was nearly sucked over the hill draping my wing across the road in front of a passing motorist! Sorry! He was good enough to stop and let me move my wing before he continued on his way. Needless to say, we packed up and went out for the day with Kyle and Elena (Daves Family). 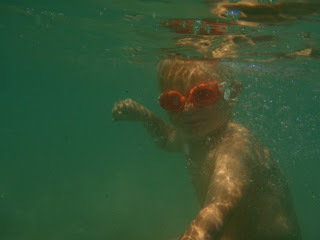 We visited a beech called Coral Bay just North of Paphos. 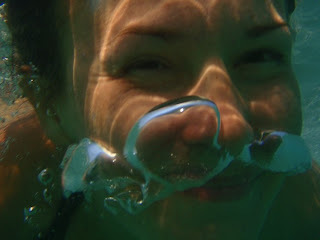 I flashed my underwater camera ( An Olympus mu 850 sw) about and got some nice pics of Kyle, Dave and Elena. They were so impressed that they are now in the market for one the same or better, but for less money. I've yet to claim the tax back on mine. 6th July was an epic day for flying. The wind was ESE which meant that the ridge to the West of the site was flyable, and boy was it! I flew for 1 hour 25 minutes (a third of my total airtime then) before the lift started to die, by the time I had decided that this was the case the landing area was awash with gliders all trying to stay up on the little lift that was left in front of the top armpit launch. I decided that I was 1 glider too many in the sky and needed to land. "Hmmm" I thought, "I could do another top landing here I reckon!" so for some reason known only to the imp that lives behind my left earI turned toward the hill to land! "Arrrghhhh" I was heard to cry "what the F*"£ am I doing?" needless to say my landing was swift and bumpy and I have the scars to prove it. I was quite lucky and got away with a mild twist in my ankle which is all better at time of writing & goarse bush scratches on my arm and both legs. Still! top landing number 2 was in the bag :) . Later that afternoon the wind had returned to normal and we had a bumpy 25 minutes over the Kurion ruins before Bottom landing and going home. A great day! 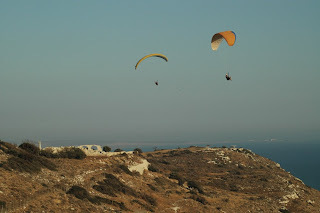 Mon 7th July, A standard day at curium and I managed 25 minutes soaring on my own. Dave had to go to work so he left me the wagon keys and I just had to have a go. That afternoon Dave joined me and stooged about for 10 minutes after work. 8th July, my last flyable day. The wind was weak and I found it very hard to stay in the lift band which was really close to the hill so I started the day with 2 x Top to bottoms about 10 minutes a piece. Dave told me where he thought I was going wrong and said get in the lift before you get in your seat! OK and I spent another 25 minutes soaring over Kurion in a 9 - 12mph S-SW wind I finally completed my week flying with a Top landing albeit a bit of a roller-coaster landing which was aided by Christakis a local pilot and tutor! Thanks for bringing me down safely Chris! I probably owe you more than a few beers.